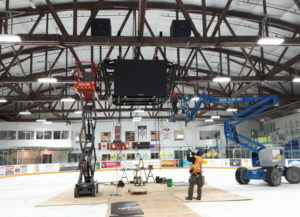 The Duncan McDonald Memorial Gardens in Trenton, Ontario, and home of the Trenton Golden Hawks Ice Hockey team, received their new Nevco video display and scoring solution from The Scoreboard Man this month. The investment, made by The City of Quinte West, is a major step in the arena’s vision to create the ultimate experience for the Jr. Hockey fans, as the Canadian Junior Hockey League (CJHL) and the Dudley-Hewitt Cup Host Cup (DHC) at the Duncan McDonald Memorial Gardens. 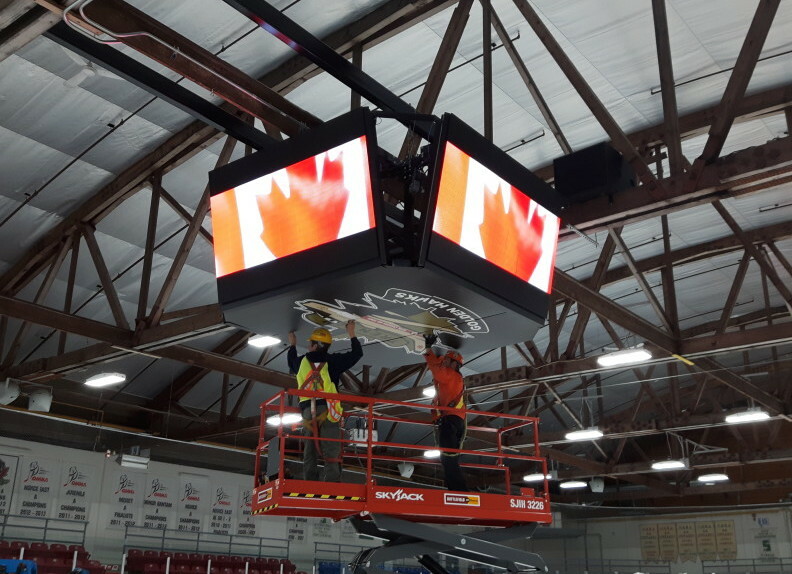 The main focal point and centerpiece of the new equipment installed in the arena is a four-sided 6mm LED Nevco Video Display that features dynamic and adaptable content zoning, controlled by Nevco’s proprietary Display Director™ Software. The Display Director™ Software allows the Golden Hawks to show one large image on the video display, or divide the display into multiple windows (i.e. zones) to show an assortment of live in-game video, instant replays of game-changing action, up-to-the-minute statistics, graphics and animations, and advertising or sponsorship messages. 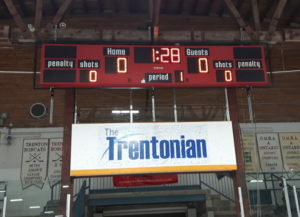 The arena is also outfitted with a Nevco Model 4725 Hockey Scoreboard for ancillary scoring needs. The new center-hung video display was installed mid-April in time for the first round of championship games starting early May, 2017.